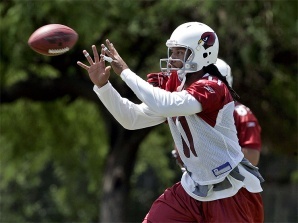 The Cardinals and their fans are breathing a bit easier today as it seems that what could have been disaster for the team and WR Larry Fitzgerald was avoided during an OTA on Monday. The Pro Bowl receiver landed awkwardly while making a sideline catch over new cornerback Bryant McFadden in voluntary practice. Reports say that Fitzgerald did the splits as he landed, his legs twisting as they went opposite directions. He was able to get up and walk away, albeit gingerly. The teams head athletic trainer – Tom Reed, was at Fitzgerald’s side. He was able to return to action later in practice. 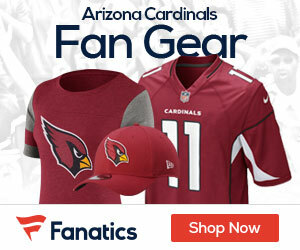 “The only thing I said to Michael Bidwill (team president) is I was sorry I didn’t beat Tom Reed over there to evaluate him,” General Manager Rod Graves said. Fitzgerald didn’t comment after practice on the play, but did say that he would be okay and he would be getting treatment on the injury.